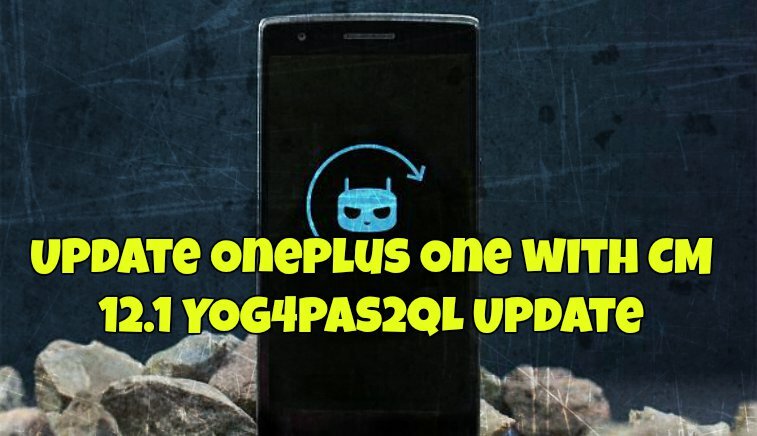 OnePlus Team released the new CM 12.1 YOG4PAS2QL Update for the Oneplus one users. It’s mostly bug fixes and security updates, it’s a maintenance release incorporating bug fixes and critical security updates. Not so big update, the OTA file is near about 18MB. Most of the Oneplus One users already installed the update and happy with this new update. Some of the users reported that after the update Battery has improved a lot. To get this update on your phone go the Settings > About phone > System updates. The OTA update is only available for the non-rooted users with Stock recovery. If you are the rooted user with TWRP recovery then you have to flash the FULL ROM on your phone. Here in this tutorial we’ll show you how to do that without losing any data from the phone. The guide is only for the Oneplus One user who is on the CM 12.1 ROM, and don’t try this method on any other phone or you will brick your phone. Read all the steps very carefully and follow all the steps one by one on your phone. Given below are two different methods. First one for the Non-rooted users with Stock Recovery and Second for the Rooted users with TWRP recovery. Step 1. Downnload the CM 12.1 YOG4PAS2QL OTA zip file here and save the file on your phone internal memory. Step 2. Switch off your OnePlus One and reboot into recovery mode. To do this Press Volume Dowen button + Power button together until the phone responds. Step 3. Now you will see the Stock recovery screen. Select “APPLY UPDATE” from the list of available options. Step 5. Select storage device which should be 0 and now select the zip file you saved on your phone. Step 7. Once done, go back and reboot your phone. Now your oneplus one is running on the CM 12.1 YOG4PAS2QL Update. Step 1. Download cm-bacon-7be76f9310-to-49d90510ef-signed.zip and save on your phone. Step 2. To apply this update first you have to unroot your phone, Download the cm-12.1.Y0G4PAS1N0-bacon-signed.zip here and save on your phone. Step 4. Flash cm-12.1.Y0G4PAS1N0-bacon-signed.zip first. Step 6. Reboot and rebuild caches. OTA aint working and hence tried the 2nd step from the above but still the below update doesnt get installed, it throws an error. pl help.